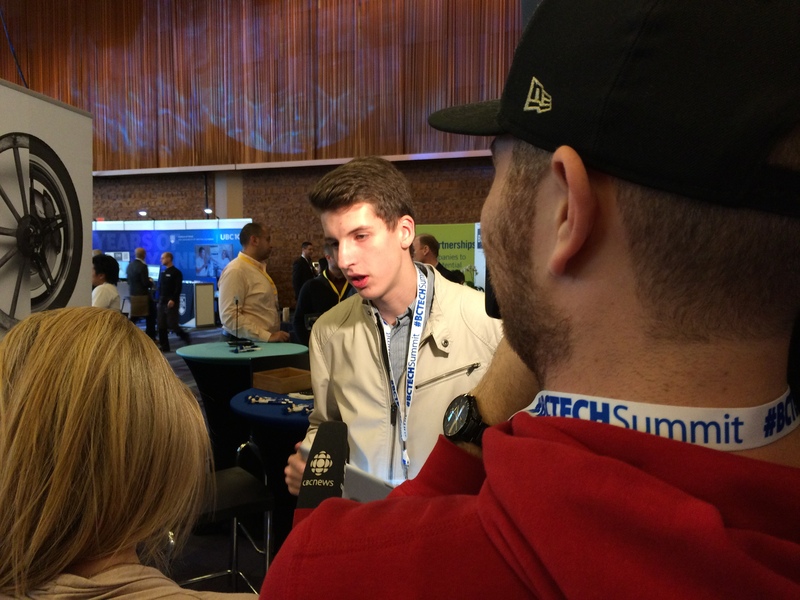 Today I had the privilege to attend the Vancouver tech conference with my friend Brandon. Because of our relationship with Fingerfoods we got to attend the event as long as we helped promote their app. I spent most of it at the finger foods stand demonstrating their app to people passing by and driving spheros (little rolling robot spheres). While doing this I met a large number of people and had some very interesting conversations. I did get a chance to tour around the other exhibits though. I am still processing all of the different booths that I got to see. Probably the coolest thing for me however was the number of news interviews and the general amount of interest the stand got. 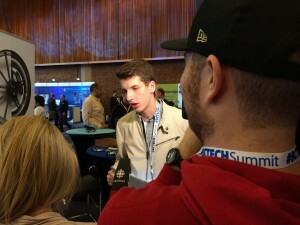 I myself got interviewed by three different new reporters from the Vancouver sun, CBC and global news! Looking forward to coming back tomorrow, this time with business cards so I can set up relationships with the people that I get to talk with. For physics class I have been asked to make a experiment to do with optics and waves. For my experiment I have decided to try to find the speed of light! The current experiment that I am building works like this. To carry out the experiment you point the laser at the mirror on the dremel and position the second mirror to reflect the laser that comes from the mirror on the dremel back to the mirror. The laser from the dremel should reflect straight back into the laser when everything is properly set up. The dremel bit should be inside to box and the laser shining through the hole in the box. How the experiment works is that when you turn on the dremel and turn up the power so that it is spinning at about 550 rotations per second or 35000 rpm. When the laser hits the mirror on the dremel it bounces to the second mirror and then back to the mirror on the dremel. The cool bit is that the dremel has turned very slightly during the time it took to reach the second mirror and bounce back causing the angle that the laser bounces of it at to be different. When you look at the final point the laser reaches, it will now no longer be right back into the laser but slightly off to the side instead. Using what we know about the difference between where the laser is with the dremel spinning and where it is when it isn’t you can find the speed of light. Now spinning something at 35000 rpm is very fast. Currently I have been running into problems with the dremel bits that I have made. The problem is that if they are even slightly unbalanced they create vibrations that ruin results of the experiment and can potentially result in the bit flying apart(which is why you need to have it in the box). Currently the second bit that I have made is looking to be very balance but is also very hard to make. Once that is made the next step for me will be actually carrying out the experiment. Recently I have been working a lot with finger foods studios. Finger foods in a software development company that offers a wide range of physical products and software services. 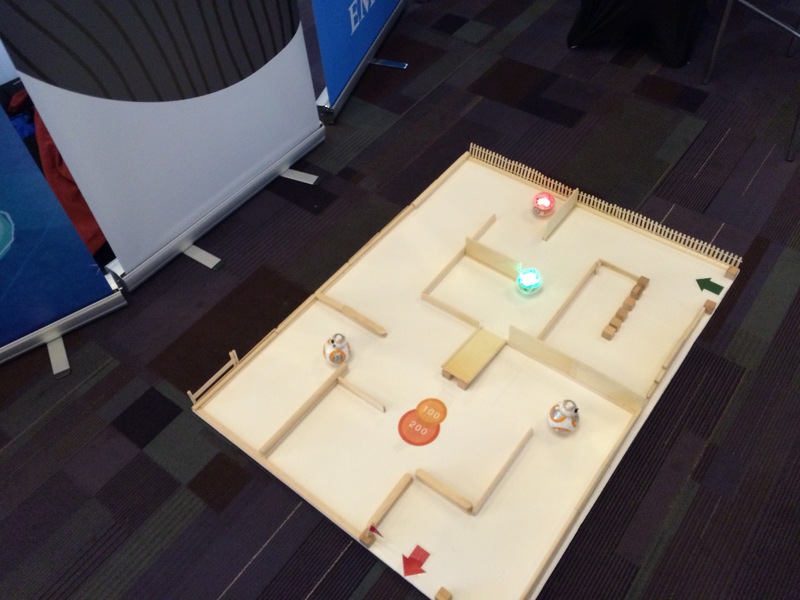 I have over the last two months been helping with finger foods with testing their app for using sphero (a mechanized ball that you control from you phone) that they want to use to teach students programming. Next Monday and Tuesday on the 20th and 21st I get to go to the Vancouver tech convention. This is a pretty cool experience for me because I will get to go to the event for free when the tickets are usually 900$! I have been getting help from some of their software engineers with Attend which I am very excited about because it needs very little work to complete and I am driving hard right now to get it done. Recently I have been working on a new app idea. For a bit of background I was at my friend Brandons house and was thinking of ways that we could use I-Beacon’s. The way we came up with is using I-Beacons to prove that a student really is inside of the school/classroom. A teacher-side app would be notified of this and check-off a student on a list showing that the student attended school/class. This app would save time for teachers which would get all of their attendance information automatically and be able to send it off to the head office. Currently we have both android, web and iOS apps nearing completion and plan to test the app in our school slightly before or after christmas break. Today in the morning to visiting teachers and after school at 7:00 to visiting parents and students. I was presenting for my school about my new project Attend. The presentations went quite well and I think people especially the teachers that were visiting in the morning liked the idea for the app which gave me more confidence that the app is actually a good idea and not just a cool idea. The world controllers in brave new world take advantage of the fact that people are always okay with what is normal. This means that for every person in the book no matter how bad their living conditions may seem to people used to something different their conditions are perfectly okay to them just like how we look down on how people lived in the medieval ages who themselves had no possible way knowing how their way of living was barbaric because they had no higher standard to compare it to. The examples in the book are the different classes of people within the world state and the differences between the ‘savages” and the people of the world state. The different classes despite the epsilons being obviously stupid by our standards and the alpha’s being obviously intelligent yet all of the other classes are quite content with their status because they have never experienced anything otherwise(the epsilons may be incapable of this as a result of the bokanovsky process) and have only been told good things about their status. The same goes for the differences between the people of the world state and the people of the savage lands who each have grown accustomed to different environments. As a reader our environment is more like that of the savages so we side with them in the story. However it is easily feasible that if we had been grown in a similar environment as the people in the world state we would have no problem with their way of life. Both 1984 and Brave new world are both dystopian worlds involving a small party in complete authoritarian control over people. However there are several key differences between the two novels. In 1984 the main protagonist Winston Smith is presented as a able minded person who slowly gathers information and eventually attempts to bring down the government but is stopped and killed. In brave new world Bernard Marx is originally presented in the same fashion but eventually prevents himself from rebellion by succumbing to himself and the way of doing things of the world state. In brave new world there are many different classes of people. The majority of people are epsilons which are the stupidest of all the different classes. The different classes are named in sequence of the greek alphabet. All of the different classes are conditioned to like certain things that are specific to their class. At the start of the book you see the babies being trained to dislike nature. The alpha’s which are the most intelligent have the hardest jobs and have to be careful about what they inquire about in the brave new world. The epsilons in contrast have very simple lives and preform menial tasks. All of the classes are conditioned to believe that they are the best class to live in and propaganda is everywhere even when they are sleeping. The bokanovsky process is responsible for the creation of the different classes of people in the brave new world. The process involves the splitting of the embryo splits up to 96 times Then embryos are placed into varying amounts of alcohol to control most physical aspects of the embryo especially intelligence the embryos are then inspected for any deformities that are unwanted for their class. This process is a major factor in how the society in brave new world is controlled allow the world controller to determine wether a person is intelligent or not. The bokanovsky process allows the creation of a cheap and reliable workforce because you do not need to worry about them revolting or worrying about poor conditions. More intelligent classes need for management and research roles can be more easily monitored as you know which people to monitor. Soma is a drug in brave new world that is basically the future equivalent of the drug ecstasy. Soma causes people to go on “vacations” and it is how people in brave new world deal with situations that they would rather not deal with. The soma in brave new world is a way for the world controllers to control the people in the world by preventing them from thinking about things that are potentially dangerous to the government. The drug is highly addictive so people like Lenina who took the drug and then stopped intensely need to keep using it. This makes it easy to guarantee that people will continue to use Soma. People like Bernard Marx who do not use soma are outcasts because they do not act or think the same way as others(at least until the middle of the book for Bernard). I think that soma is a commentary by the author on how various ways that people avoid problems through distractions.